Do you sometimes feel there’s not enough time to get all the tasks done in a day? Virtual Assistants usually have several clients – each with a variety of tasks to be completed. Often these tasks are done on a daily basis. If you have a dozen clients and need to touch their account daily and complete three different tasks for each of them every day, that’s 36 different things you need to schedule that day. How do you manage your time to get everything scheduled done? 1. My Google calendar helps me see at a glance for the day, week, or month what client calls I have scheduled, what projects are coming due, and gives me a daily reminder to check my daily task list. 2. 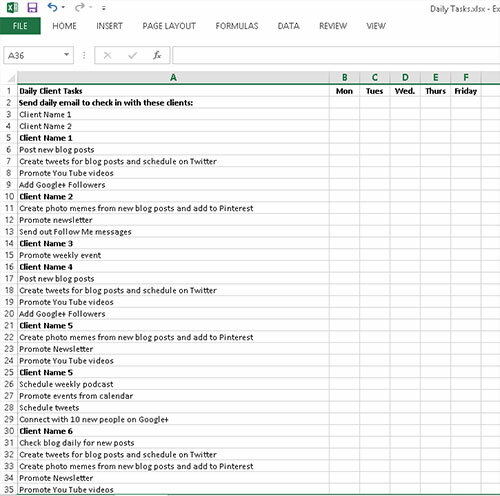 Currently my favorite way to be sure I get everything done I need to do everyday is to use a spreadsheet similar to the one pictured here. Each Monday morning I print out my daily task list and then physically check off each task as I complete it each day. I had tried to do this on the computer without printing it out. However, I love the feeling of having something in front of me I can see, touch, and write on. Since I have so many clients with so many different things to do, I actually have a 2-page task list. It sure has helped me accomplish a lot. Everyone has their favorite time management tool. I’d love to hear what works best for you. 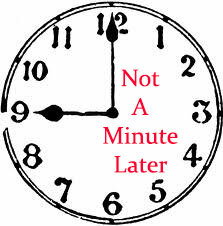 Keeping our word leads nicely to the next personal habit: punctuality. Yup; just plain being on time. It falls squarely in the first two dissatisfaction-eliminating facets of customer service: accuracy and availability. Punctuality isn’t just about being on time for a meeting, although that’s critical. It’s also about timely delivery, whether by mail or in person. It’s about timely response, by phone, email, or smoke signal. We’ll come back to that in a bit. As VAs we need to give realistic estimates of timeframes, then do all we can not just to meet them, but exceed them. That’s how word-of-mouth is created, not by simply doing what’s expected.